Start by making the crust. In a bowl, combine the flour, salt, and sugar. Cut in the butter until the mixture resembles coarse crumbs. Drizzle in the ice water and mix until it comes together to form a dough. Form into a disk and refrigerate, covered, for 20 minutes or until ready to use. Preheat the oven to 425 degrees. Line a baking sheet with parchment paper. Combine the berries, lemon juice, sugar, and flour in a bowl to make the filling. Roll out the dough into a 13-inch round and lay it on the parchment-lined baking sheet. Pour the berries in the center of the circle and spread out, leaving a 2-inch border around the edge. Fold the edge up over the filling. Dot the last tablespoon of butter over the berries and brush the dough lightly with egg wash. Bake for 25 minutes, or until bubbly and golden brown. In the last ten minutes of baking, make the vanilla sauce. Beat the egg yolks and sugar together until the yolks are thick and pale yellow, about 2-3 minutes. In a saucepan, scald the milk (until it’s just under boiling). Temper the egg yolks by gradually adding a quarter cup of the milk mixture into the yolks, whisking constantly. Then gradually whisk the yolk mixture into the rest of the milk. Continue whisking over medium heat until thickened. Remove from heat, whisk in the vanilla extract and a pinch of salt. Let the galette and the sauce cool slightly. 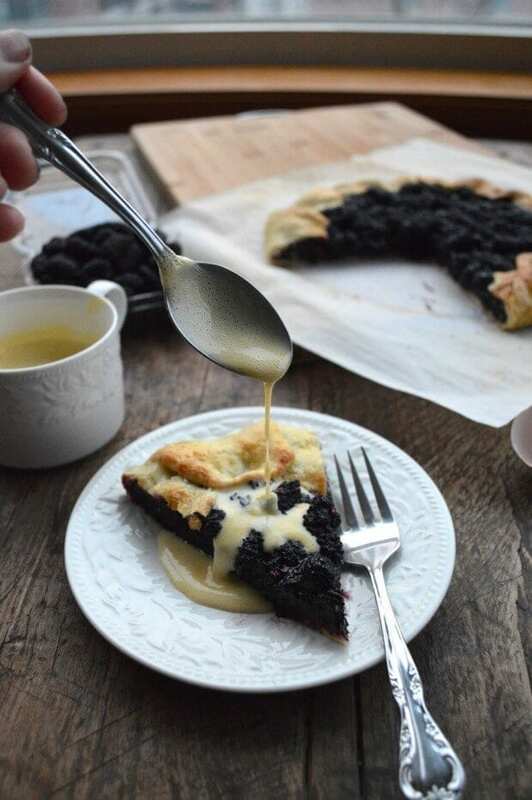 Slice the tart and serve with a drizzle of warm vanilla sauce.